Here's an easy and delicious dessert to make when your oven is otherwise occupied. It's a simple recipe using simple ingredients. Sometimes those are the best ones, don't you think? In a heavy-bottomed saucepan, combine the milk, rice, and salt. Place saucepan over high heat and bring to a boil. Reduce the heat to medium-low and simmer until the rice is tender (about 25 minutes). To prevent the rice from sticking to the bottom of the pan, stir the mixture frequently with a rubber spatula or wooden spoon. 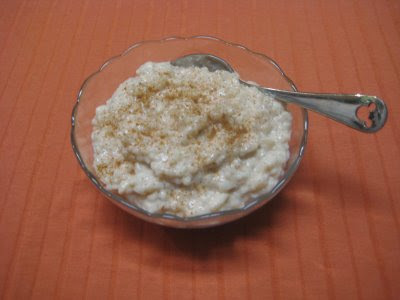 When the rice is tender, remove from heat and add the sugar and ground cinnamon. Return to heat and cook, stirring constantly, until the pudding thickens, about 10 minutes. If you prefer a thicker pudding, continue to cook and stir until it reaches the desired consistency. Keep in mind, though, that it will continue to thicken as it cools. Remove from heat and add the vanilla extract. Stir until well combined. Serve warm or chilled. -For an even richer pudding, substitute half of the milk with half and half. -If your pudding has become too thick, just add a little milk, a tablespoon at a time, to loosen it up a little. -If you like raisins, go ahead and add about a cup when you add the vanilla. Also feel free to add other flavorings in addition to the vanilla such as coconut or rum extract. Yum! !